Santia Deck has taken her world class athletic ability and used it to take the sports media world by storm. When Santia Deck was only 2 years old, a doctor’s comments about her having the body of a runner set the wheels in motion. Deck started track at the age of seven and never looked back, going on to receive a full scholarship to run at Texas A&M University-Kingsville, majoring in English. Santia would run the 100m, 200m and 4x100m. Deck’s bid for a National Title in the 4x100m was halted by the decision to start her media and fitness training career. Getting her career started was an understatement. Deck began by receiving her certification through AAAI, American Aerobic Association International. This would bring forth Deck’s personal training brand, The Queen of Abs. queenofabs.com is now a platform for Deck’s online training which has help thousands of people across the country with the loss of belly fat. “I have everything from meal plans to weight loss, strength and speed training, among other things,” said Deck. Deck also has a Queen of Abs TV show in Detroit Michigan, appeared on Steve Austin’s Broken Skull Ranch and does public speaking on the empowerment of woman. Needless to say, Deck’s schedule is always full. Deck admitted her main form of media has been her use of Instagram. Deck now has 304,000 followers and is a major brand social media influencer. With brands like Coconut Water, Vitamin Water, Adidas and GNC on the list, it is easy to see Deck’s strong presence in social media. When I asked how Deck was able to create these relationships with major companies, it was a simple answer. Deck is doing much more than becoming a social media icon. Deck plays a high level of flag football in the AWFFL, Atlanta Women’s Flag Football League, holding the season rushing title for three of her seasons. Deck also plays flag football for team USA and will have her first game with the team this May in Germany. Deck has been coined the Barry Sanders of Women’s Flag Football. If you check out her highlights, you’ll see why. Rugby has also become a passion for Deck. 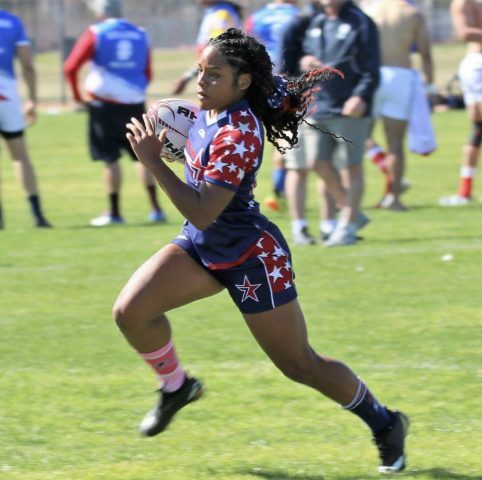 Her high level of play in the world of women’s flag football drew attention from the Women’s Eagles Sevens’ Rugby team in 2015. Unfortunately a coaching change forced Deck to step down from the team. “I was really fast, but didn’t know the game well enough,” said Deck “I was told to come back when I learned the game better.” That is exactly what Deck did, going to play for the Atlanta Harlequins and The Stars travel team. Now Deck is back on the road to the Olympics. All the success Deck is having has not clouded who she is and what she holds dear. Deck has a place in her heart for children. Deck made a special appearance at the 90 Days of Love event in Lithonia, Georgia. This event was a Christmas breakfast and coat drive for deprived children. “The youth are very near and dear to my heart.” said Deck. Deck is also the Author of The Struggle, available on Amazon. It is a book about a boy enduring child abuse in his home. “I was not abused as a child, but I have friends that were and i felt it was important to tell this story.” said Deck. Deck has many irons in the fire. She is a world class athlete training for the Olympic Rugby team, CEO of her fitness company, a social media giant, a brand ambassador, Author, TV star and the list goes on and on. Through all these successes Deck keeps her moral compass and remains a role model for young women.